Potato leafhopper (PLH) is a key pest of spring-seeded alfalfa. Small size makes PLH an easily overlooked, but costly, pest. Top pest management priority should go to spring-seeded stands. The recommended 70 to 90 day growth period before first harvest allows time for damaging numbers of PLH to develop. However, a long, cool spring and a compressed planting schedule can mean that the first cutting of alfalfa will be late, giving leafhoppers extra time to feed and increase populations in established fields. PLH is a migratory insect that moves north on warm south winds from the Gulf States each spring . It shows up in established alfalfa fields during May, but the date can vary from the first to the last of the month in any given year. Significant numbers of leafhoppers may find their way into spring-seeded fields in spring with a rapid increase during June and a peak in early July. The leafhopper usually disappears from Kentucky alfalfa fields in late July. In a recent study, researchers demonstrated the impact of climate change on this specific migratory pest. PLH arrives in northern states an average of 10 days earlier than it did in the 1950s and it is causing more damage in years with warmer average temperatures. With a host range of more than 200 plants from alfalfa to hops, the importance of this insect is increasing across the country. PLH can affect alfalfa in several ways. Insertion of their piecing sucking mouthparts to feed on sap physically damages vascular tissues of stems and leaves, and it blocks the phloem. Hopperburn, the characteristic symptom, results from the accumulation of photosynthates in leaves. It begins as a V-shaped wedge of yellow extending from about the middle of the leaf to the tip (Figure 1). PLH impact on plants is significant and can include stunted growth, premature leaf-drop, reduced root carbohydrate reserves, and drastic reductions in protein content of hay. In sufficient numbers, PLH can reduce yields up to 25%, as well as lower crude protein, vitamin A, carotene, calcium, phosphorus, and digestible dry matter content. 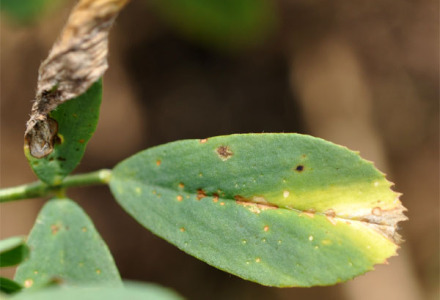 Reducing losses means detecting potentially damaging numbers of PLH before symptoms appear. Adults are small and flighty; nymphs are even smaller. Detection and assessment of populations require a 15-inch diameter sweep net. Taking five sets of 20 sweeps from randomly selected areas in a field, coupled with the average plant stem height, is the way to detect and assess the pest before the crop is damaged. A single, well-timed application of any one of several insecticides will provide excellent leafhopper control if numbers exceed treatment guidelines. Refer to the Extension publication, Potato Leafhoppers (ENTFACT-115), for more information. A 35-day harvest schedule generally keeps leafhoppers from building to large numbers. Cutting drives the winged adults out of the field. The wingless nymphs are unable to leave and most starve or die from some other cause before regrowth starts.